A mad sled race through the Arctic circle. Thank you to Sean for recommending this game to me in 2013 when I told him I wanted to get the ancient racing game Hare & Tortoise (1974), the first winner of the Spiel Des Jahres (1979). That game is even more 'mathsy' than Snow Tails, though I've still not played it yet. Time to play: Approximately 45+/- mins. Can be a drawn out game with everyone strategising and calculating speeds. Price Range (AUD): About $55 + Shipping, making for a total of about $70 to $75? I see one site selling it for $120. All of these prices are ridiculous. I got mine for $60 in October 2013, which, in hindsight, was still somewhat expensive. Availability: Definitely can be located online but there aren't as many listings for the game as I thought there would be. Should be in a few hobby stores but it could be on the backorder. 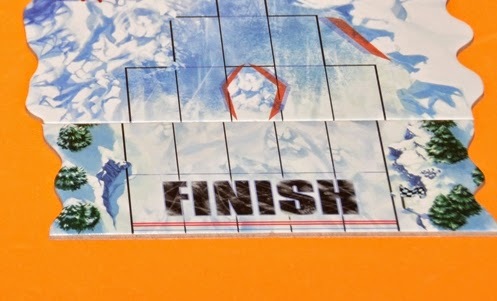 I had a difficult time deciding a score for Snow Tails, but on balance, my conclusion is that it passes the "Great" game rank because of its interesting sled mechanics and the tension associated with overtaking your rivals. Players race their sleds through a FULLY CUSTOMISABLE track, taking care not to collide with other sleds and the sides of the track! In certain situations, caution must be exercised when entering corners - if the player speeds over the speed limit designated for that corner, they will incur damage to their sled, which limits their hand size, hence reducing their future movement options. These perils of travel mentioned above, coupled with its competitive nature and sheer variety of tracks offered by the generous Lamont brothers, makes Snow Tails a great game. My only complaint is the rather huge 'luck' factor (present in all card games of course) that makes it difficult for even a skilled gamer to negotiate - for example if your sled is stuck in a tight corner and is blocked by trees and other racers, sometimes you will inevitably be forced to take damage because your cards are just not right for the situation. But that's just a facet of the game you're going to have to deal with. This situation becomes even more annoying and unfair if you are coming last, and, if that portion of the track is congested, everyone else is blocking your way [see the example below under the heading 'Calculations of Speed and Drift, with an example']. Though the game does award a bonus/benefit directly proportionate to your position in the race, this is largely unhelpful in these aforementioned bottleneck scenarios. Another aspect of the game that people might not like is the adding up and subtracting that goes with it - there's a lot of that because on each turn you are constantly monitoring and calculating your speed. In addition to that, the cards you play will influence to what degree your sled will navigate left and right (this is called Drift, which is a critical skill required to dodge other sleds and players). If you can deal with those complaints, you have a nice (but perhaps stretched out) game waiting in store for you. Wide variety of tracks to assemble and customise!! Strategic planning and foresight required, to an extent. Related to the above, the concept of drift is interesting and critical to navigating around trees, corners and even cunning (or clueless!) drivers blocking your way. Mathsy or mathematical to a degree for those who hate that sort of thing: you constantly have to calculate speed and plan your movement to avoid obstacles and opponents. Person in poll position or the lane in "first place" tends to have an unfair advantage on tricky tracks which can't be made up for with the bonus for racers that are trailing, particularly with areas where space is confined and congested. Skilfully navigating your way through a tricky obstacle course by adjusting your speed and drift, whilst trying to beat your rivals to the finish line makes for an interesting challenge. This game provides LOTS of racing track tiles for you to customise a long or short race. However some of the tiles are slightly repetitive - I wish they gave a bit more variety. A forest of pine trees (uncompleted - just to show you the board) followed by a bend and a narrow corridor. You will note that everyone starts off with 2 huskies each with an equal speed of 3. Furthermore, your brake speed is also set at 3 (at the bottom). Everyone draws 5 cards from the deck. Play starts with the 'leader', the person in the number 1 lane to the far right (in the above setup, this is Green). 1) Play 1 to 3 cards: The cards played must be of the same value. For example, you could play a lone 4; double 3's or triple 1's. You MUST play at least 1 card on your turn. Drift, which is the number of times your sled moves left or right. Drift = The difference between one husky's speed value in relation to the other. The sled will move in the direction of the husky that is travelling FASTER (the one that has the higher speed value). As you can see the above path is fraught with difficulty and danger! The whole roadway is blocked with trees and, to make things worse, the Red, Green and Blue racers are blocking important spots! Black plays two Fives; One on the right husky and she discards the other to change her Brake speed to 5. Total Speed = 3 + 5 - 5 (brake speed) = 3. This means Black will move a total of 3 squares. Total Drift = 5-3 = 2 to the right (since the right husky is moving faster). Thus Black, currently coming last, makes an incredible move to tie it up with first place. Black's sled moves diagonally to the right twice (this is the consequence of Drift) and then 1 space forward to make a total of three moves. If you crash into an obstacle (tree or sled) or the side of the track, you must take a dent card. This reduces the size of your hand by 1 permanently! For each unit of speed you are over the speed limit (which occurs during each turn of the bend), you must take 1 dent card. Hence if the speed limit was 3 and you were doing a speed of 5, you'd take 5-3 = 2 dent cards. There is a special rule that says if your huskies are travelling at the same speed, your sled gets an optional bonus speed equal to whatever your position in the race is. Thus, this bonus is most effective if you are coming last in 5th place as you get a +5 movement. It is less effective (but still useful and important) if you are coming first. You either take ALL or NONE of the bonus - you can't take it partially. In this below scenario Red is coming 4th. He has to be careful of the speed limit of 3 - if he goes over the speed limit he will take dent cards which will handicap or incapacitate him for the rest of the race (as he'll have less cards to draw from). Winning is not just whoever crossed the line first; it is whoever passes the finishing line by the furthest distance on the same round of turns as the first person who finished first. For example, assume that in a five-player game the turn order is A, B, C, D and E in that order. B crosses the line first. C and E are unable to cross the line on their turns but D crosses the line. Racer A does not take another turn as her turn already occurred in the same round of turns as when B crossed the line (ABCDE in that order). Therefore whoever between B and D is furthest across from the finishing line wins. If there are ties then whoever finishes closer to the chequered flag wins.